I always feel so proud of myself when I manage to make identifiable origami. This notepaper set not only turns into cute (identifiable!) origami characters, but also gives you space to write secret messages. Created by Lollipop Designs, these Origami Notepaper Sets are such a fun way to send notes to friends. Just write a note on the reverse of the paper, follow the fold instructions and pop it into its envelope! Kids (and grown-ups!) will love receiving messages on this adorable notepaper. At $14 for a pack of 10 sheets with envelopes, you can stock up on a few different character options. I like the watermelon set a lot, but it’s hard to go past the panda and badger sets for cuteness. 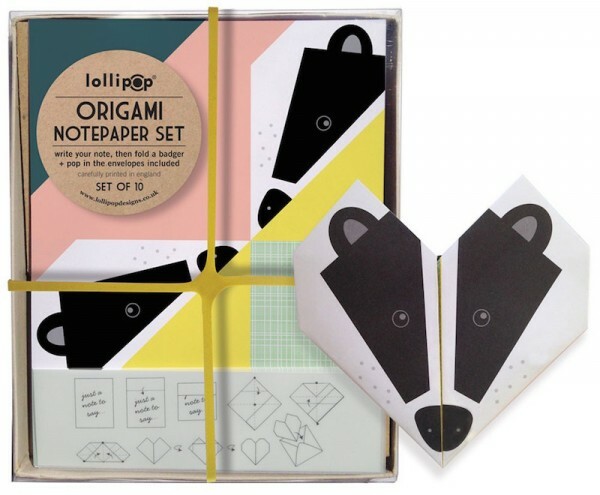 Made on 100 per cent recycled paper, the notepaper sets are a great gift idea for older kids. Although, a slightly older older kid, I can pretty easily see myself getting addicted to note writing as well. These sweet sets are available through Lollipop Designs.